From the baby L1C to the MAMMOTH IT6, we have a crate that’s perfect for you. 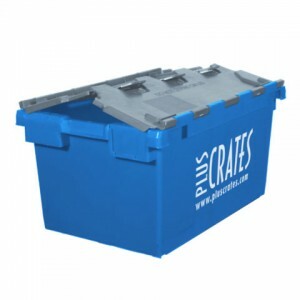 The L1C is the smallest crate in our range, perfect for moving personal items securely. Widely used in office moves as a “locker crate” for the personal belongings of staff members from their locker or desk, ideally sized to one per employee. This can handle items that are approximately A4 in size, such as magazines and booklets and other small personal possessions. 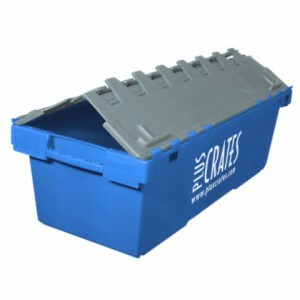 As these are our smallest crates, they are also ideally suited to people that may struggle to lift the larger containers when full. As with all out lidded crates, the lids can be securely fastened with security seals or numbered security seals for added security and when the chain of custody is vital. 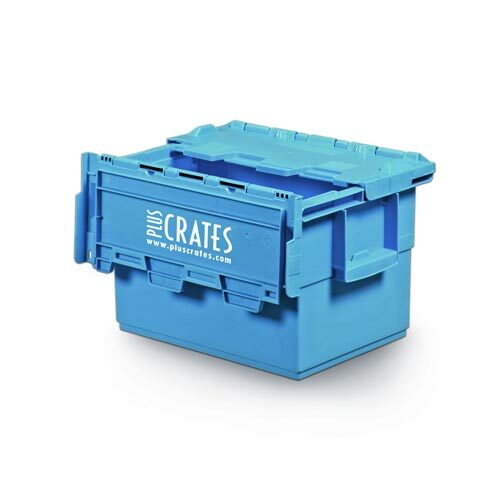 The L2C is the second smallest crate in our range, also known as the “stair crate” for the reduced width of the container when holding it by the handles. The reduced width makes it a perfect choice for home moves, where the width of the stairs may cause issues with the larger crates. 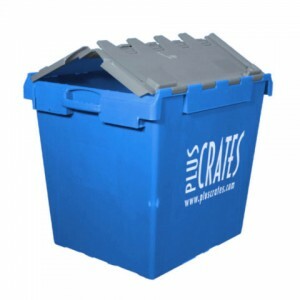 The L2C is also widely used in retail distribution where they are called totes as opposed to crates. As these are smaller than the standard L3C, they are also well suited to people that may struggle to lift the larger containers when full, though the L1C is still preferable if this is a concern. As with all out lidded crates, the lids can be securely fastened with security seals or numbered security seals for added security and when the chain of custody is vital. You can also use padlocks when additional security is necessary. The L3C is the most popular moving crate in the industry. It has become a staple of the moving and relocation industry. The L3C will be the first choice of plastic moving box, as it is the ideal size for most moving requirements, whether home or office move, with an excellent balance between size, weight, and cost. When size and weight may be an issue, the L2C and L1C are popular choices. The L3C is robust, stable, and weatherproof, which provides excellent protection for your valuables during a move or in storage. The weatherproof construction has become popular in storage situations and where there is any risk of flooding. Make sure you specify the crates don’t have drainage holes in the base. As with all out lidded crates, the lids can be easily secured with security seals or numbered security seals for added security and when the CoC (Chain of Custody) is vital. You can also use padlocks when additional security is necessary. The L6C is the longest moving crate available. It has become a staple of the moving and relocation industry and is ideally suited to relocating libraries as the metre width of the crate is the same as standard library shelves. The L6C is also popular with office moves, as it is capable of taking large amounts of files from filing cabinets in one go (The accepted recommendation is one L6C per drawer of filing cabinet as larger office drawers are 1 metre, the same length as the L6C. Smaller office filing cabinets may be less than a metre deep and therefore you will be able to store more than one drawer per crate). The L6C is just as robust, strong, and weatherproof as the other crates in our range, which provides excellent protection for your valuables during a move or in storage. The weatherproof construction has become popular in storage situations and where there is any risk of flooding. 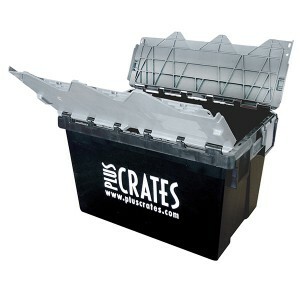 Make sure you specify the crates don’t have drainage holes in the base. As with all out lidded crates, the lids can be easily secured with security seals or numbered security seals for added security and when the CoC (Chain of Custody) is vital, such as moving sensitive data, personal items, or private files. You can also use padlocks when additional security is necessary. The IT3 is the smaller of the computer or IT crates, originally designed to house one computer with one flat-screen monitor, plus mouse and keyboard etc., it has gradually grown in popularity as the size of the computer has shrunk. This is a popular choice among IT companies and office moves. The IT3 will usually make it into an office relocation where computers are going to be moved, the crate is specifically designed to fit with the IT6 as the lid and base are the same sizes as those on the IT6. The IT3 computer crate is weatherproof, robust, and strong, which provides excellent protection for your valuables during a move or in storage. The weatherproof construction has become popular in storage situations where there is any risk of flooding. As with all out lidded crates, the lids can be easily secured with security seals or numbered security seals for added security and when the CoC (Chain of Custody) is vital, as is usually the with moving or storing computers that may contain sensitive data. You can also use padlocks when additional security is necessary. The IT6 is the larger of the computer or IT crates, while also being the biggest crate by volume that we supply. Originally designed to house one computer with one CTR monitor, plus mouse and keyboard, etc., it has become more popular with moving servers, as the size of desktop computers has shrunk, and CRT monitors had all but died out. The IT6 is a highly popular choice among IT companies and office moves. The IT6 will be utilised in an office relocation where large computer workstations or servers are moved. The IT6 crate is specifically designed to fit the IT3 as the lid and base are the same sizes as those on the IT3, which makes it easier to stack them together. The IT6 computer crate is weatherproof, robust, and stable, which provides excellent protection for your valuables during a move or in storage. The weatherproof construction has become popular in storage situations where there is any risk of flooding.